Bewilderment may be a better word for the mood of the session whose participants all claimed to be committed to open access publishing. The plan by about a dozen of the leading funders of research in Europe responsible for €7.6 billion (US$8.8 billion) is to mandate that all papers that are the product of research funded by them be free to read as soon as possible. “No science should be locked behind paywalls!” was the declaration in the preamble to the plan. The initiative still lacks detail, but it is clear that it’s meant to stamp out hybrid open access business models which will now be declared as “non-compliant.” Hybrid models of publishing typically make papers immediately free to read if a scientist wishes, but keep most studies behind paywalls. In 2017, only about 15 percent of papers were published immediately as open access. More than one-third of journals still publish papers behind a paywall, and typically permit online release of free-to-read versions only after a delay of at least six months. Just less than half use a hybrid model, in which the author pays the publisher for certain services. More than one-third of journals still publish papers behind a paywall, and typically permit online release of free-to-read versions only after a delay of at least six months. Britton points out that in the UK, the Netherlands, and Sweden, there are already agreements to allow access to materials. There was also an evident worry shared by all three speakers that the impact of Plan S would be felt disproportionately by the funding-starved humanities and social sciences. “I don’t understand how a model that has been developed out of medicine can be transferred across to the humanities and social sciences,” said David Ross, executive director of open access at SAGE Publications, which represents around 200 social science societies. “Thousands of small social science publishers will be endangered by this. We are trying to get in front of the implementation task force to talk about how Plan S will work in different disciplines and the implications for all the societies that we represent. Legge said she felt that being the independent publishing arm of a learned society gives her an advantage in the Plan S world of being focused on a global discipline. However, she believes that their size could be a disadvantage. American publishers may solve the problem by deciding not to publish European research that only accounts for 2 to 3 percent of their content. For the authors, she is worried that Plan S may impose burdensome paperwork because the problem for the architects of the plan is that science crosses borders. It was clear by then that Plan S may have consequences unintended by its designers. The end of the hybrid model may drive further consolidation in the market despite the protestations of publishers like Legge that they are committed to remaining independent. In an age of walls being built to divide people, Plan S may create another. When faced by the demands of Plan S, American publishers may solve the problem by deciding not to publish European research that only accounts for 2 to 3 percent of their content. The panelists felt that even if Plan S accelerates the transition to open access publishing, it still represents an existential attack on the academic publishing industry. While some publishers say they are staring into the headlights of Plan S like a deer, others say it should be a call-to-arms by the industry to challenge the stereotype that all they care about is profit. 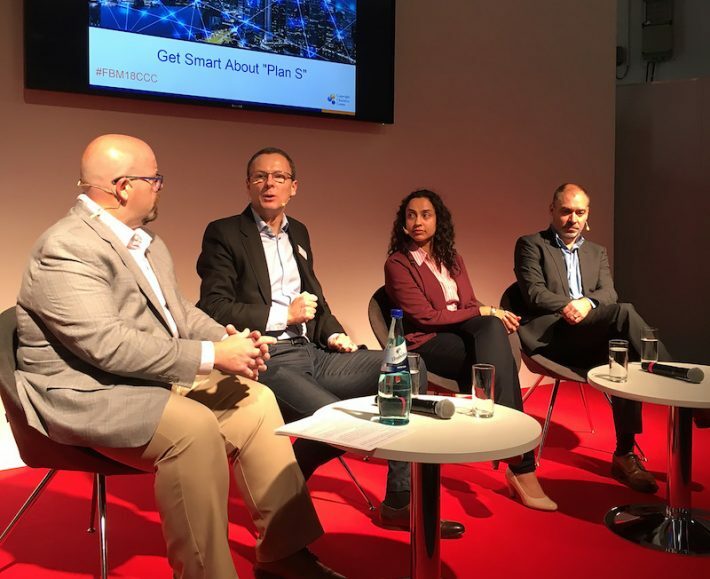 More from Publishing Perspectives on open access is here, and more on Frankfurt Book Fair is here.